Buying seafood is a great option for your dinner. It’s quick and relatively easy to prepare, it’s different and highly tasty, and most importantly it’s incredibly healthy as a very lean source of protein that also is rich in amino acids, vitamins and healthy oils. However choosing fish at the market can be somewhat difficult – you have no way of telling how fresh the meat exactly is. However there are fortunately a few ways to hazard a very educated guess on this front. Here are some ways to ascertain how fresh fish is. 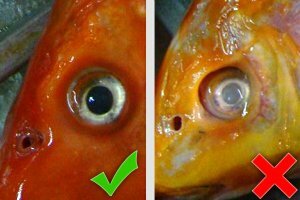 Eyes: The eyes of your fish should be bright and clear. If the eyes have faded and look dull then this suggests the fish has been here a while. It may still be safe to eat, but it probably isn’t going to taste as good as the others. Shine: A healthy and fresh fish should be shiny and look metallic and clean – just like you’d expect the scales to look when it was alive. If it looks dull and patchy then this is again not as fresh. Smell: A fresh fish will smell like clean water or salt water, or it may smell briny. If it smells really bad on the other hand then it will probably taste pretty bad too. Gills: The gills of a fish should be bright crimson and not dark red or brick colored which will happen with age. Flesh: The flesh here should be pristine and smoothly metallic just as it is on the whole fish. Again if it is faded or patchy then this is no good. Smell: Smell is even more important for fillet. If it smells bad then look for another fish. Liquid: If there is liquid on the meat then it should be clear. 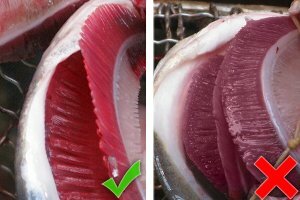 If there is a milky looking substance on your fish then this is the first stage of rot – i.e. not good. Buoyancy: Press the fish with your finger (if the monger doesn’t mind). You’ll make a fingerprint, but if it immediately disappears then you have a winner on your hands (literally… wipe it off). If the fingerprint remains then that’s one mushy and not-nice tasting fish. It is mostly shell fish that are sold live, so here the important thing is to look for signs of life. The livelier and happier the fish the better. If you are choosing a lobster in a restaurant then, impress your date by picking the one that’s running around and having the time of its life. It may seem cruel, but a happy lobster is a tasty one. The one lying motionless in the corner may not have eaten in a while (this happens a lot) and that will mean that there’s barely any meat inside when you crack it open. When choosing live shell fish in the market meanwhile this will normally consist of oysters and clams. Oysters are tricky to tell, but clams should react to your touch. If they don’t, then they’re probably dead. If you can’t tell then you’ll be buying a few anyway. When you cook them the dead ones won’t open up so those are the ones you want to discard. There are some fish that are better frozen. These include shrimps, squid and octopus. For scallops you’re looking for dry packed.